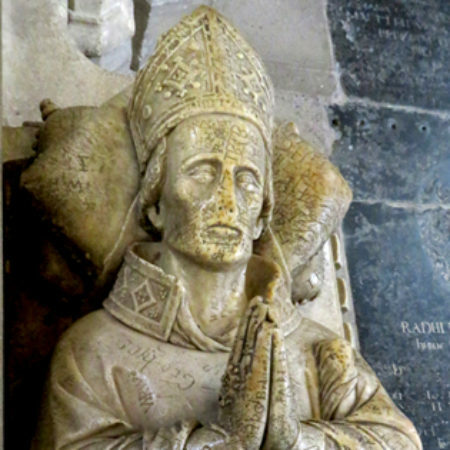 One of the earliest surviving alabaster effigies to a member of the higher clergy is that to Ralph of Shrewsbury, Bishop of Bath and Wells (d. 1363), in Wells Cathedral (Somerset) (Fig. 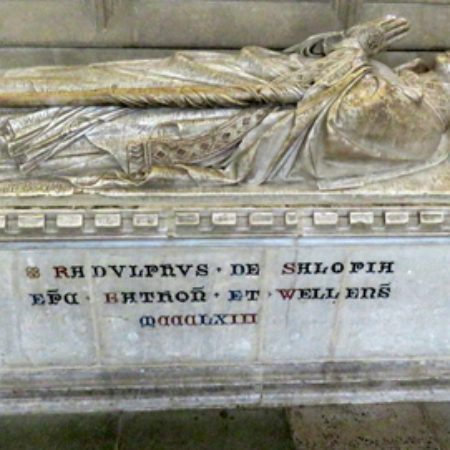 1).Bishop Ralph’s effigy was originally in a place of high honour in the middle of the choir before the high altar in Wells cathedral. 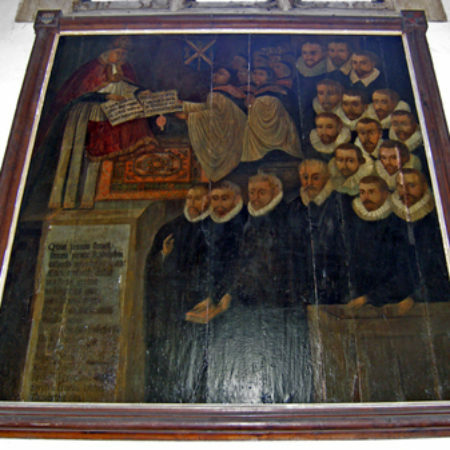 However, it was apparently moved out of the choir about 1550 and appears to have been in its present position in the North Choir Aisle at least since the early eighteenth century. The graffiti pattern and dates indicate this. It is very dense on his left side but almost absent on his right side, against the wall (Fig. 2). Apart from this, the effigy is relatively well preserved. 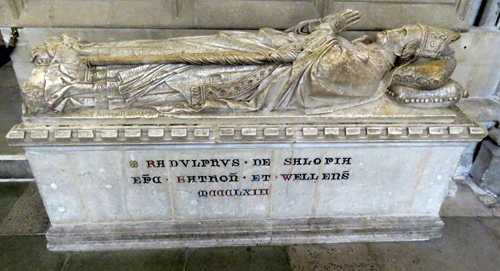 Bishop Ralph is shown lying recumbent, with his head supported by a pair of pillows and his hands held in prayer. The carving is very well executed and the head of his staff, which is broken off, was originally fully undercut. His most curious feature is his mitre, which is shown hinged at both sides and secured by pins (Fig. 3). 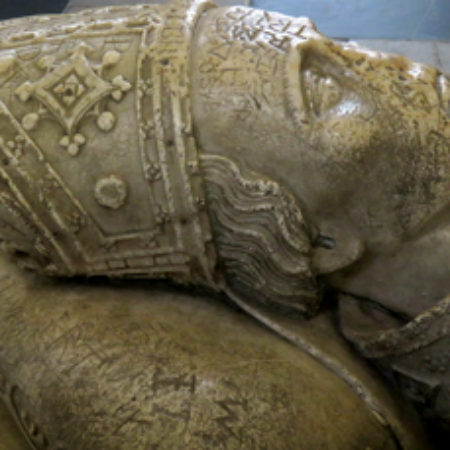 The effigy was evidently used as a model for that of Bishop Harewell (d. 1386), which is also alabaster and again has a hinged mitre. A special difference is at Harewell’s feet where the two collared dogs shown with Bishop Ralph are replaced by two hares, as a pun on Harewell’s name. Previously Chancellor of Oxford University 1328-29, Ralph of Shrewsbury, a man of obscure origins, was the unanimous choice of the monks of Bath and of the canons of Wells when elected to that see in 1329. 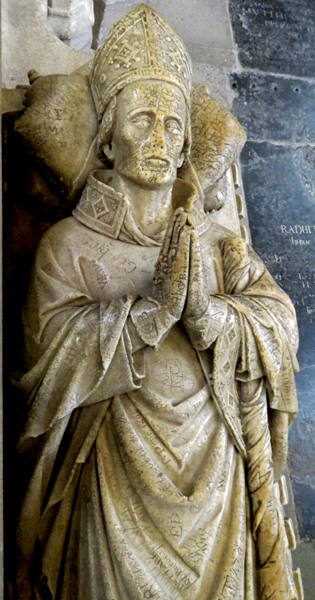 His consecration took place without the assent of the Pope, for which unfortunate haste Bishop Ralph had subsequently to pay 2,000 florins into the Roman treasury. His legacy rests on his pastoral activities during the years that he was diocesan bishop, as a result of which he gained a reputation for sanctity. 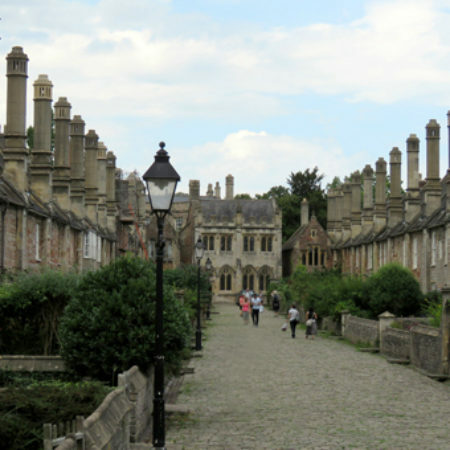 Bishop Ralph also restored many of the palaces belonging to the see and surrounding, with lofty walls and a deep moat, the episcopal palace at Wells. 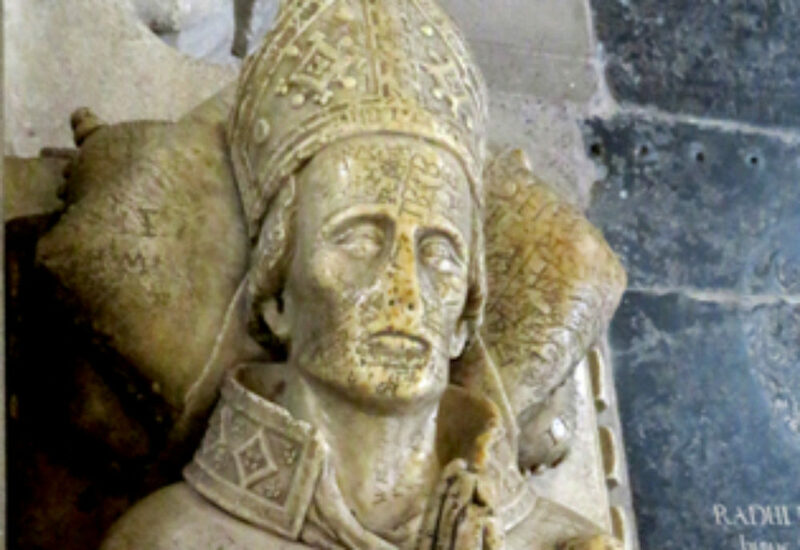 It is probable also that the recasting of the eastern limb of Wells Cathedral was mainly the work of this bishop. 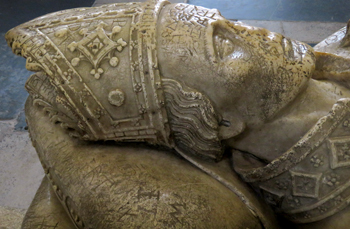 Although not closely linked to Edward III’s court, Shrewsbury’s contribution to the monastery doubtless led to his commemoration by a fine monument in the latest fashion, which for some thirty years after his death was a popular place of veneration. 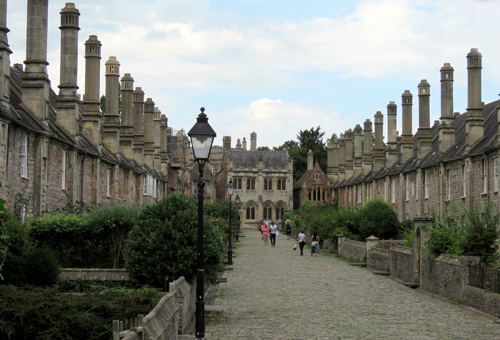 However, Ralph’s principal benefactions at Wells were in support of the minor clergy.He founded the college of vicars, procuring license of incorporation for them, building them dwellings, a chapel, and hall, in ‘the vicars close,’ that they might live together; providing them with an endowment separate from the capitular estates, and drawing up rules for their conduct. The close survives (Fig. 4). 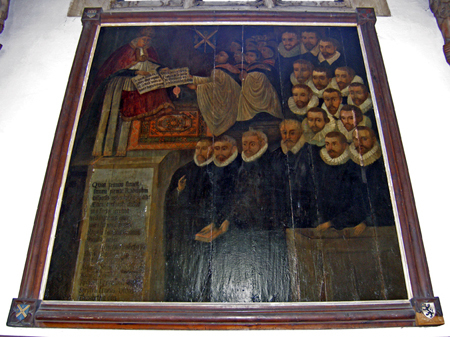 At Wells Cathedral is a commemorative panel painting, dating from the later-sixteenth or early-seventeenth century, in which the vicars are seen kneeling at the feet of the bishop, with this inscription attached: ‘Per vicospositivillae, pater almerogamusUtsimuluniti, tedante domos, maneamus [We are lodged in the streets of the town, but beseech you, dear father, that if you give us houses, we may be able to live together]’. The bishop benignly responds: ‘Vestrapetuntmerita, quod sintconcessapetita, Utmaneatisita, locafecimus hic stabilita [Your merits plead for you that what you ask should be granted; we have built permanent lodgings so that you can live as you ask]’ (Fig. 5).